Then I realised the special thing about this Reuben thing is Corned beef! HA! Perfecto~! Because I can use DONKEY MEAT instead, it will work the same! Got try this recipe SOON! The Reuben sandwich gets a makeover in this easy and crowd-friendly appetizer. Score the loaf of bread paralell and perpendicular in 1-inch cubes, making sure not to cut all of the way through the bread. In a bowl, combine the sauerkraut, corned beef and Swiss. Put the loaf of bread on a baking sheet, and carefully pulling apart the cubes, stuff the mixture into the crevices, distributing the mixture evenly over the whole loaf. Place the loaf in the oven, and bake until the cheese is melted and bubbly, 10-12 minutes. Meanwhile, mix together the sour cream, ketchup and relish. Season with salt and pepper. When the loaf is done, either squirt the sauce over the top of the loaf, or serve the sauce on the side for dipping. 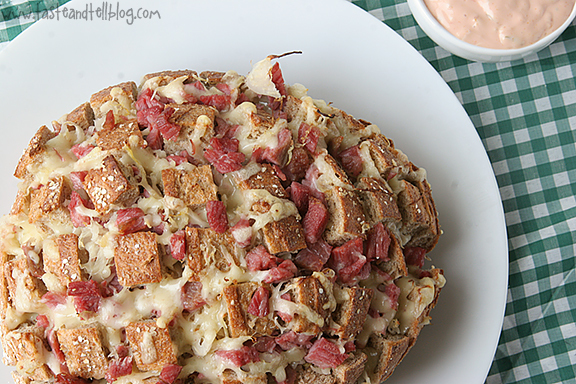 This entry was posted in Cooking and tagged Bread, Reuben by shaoxilizheng. Bookmark the permalink.